Why is the Crow Black? And Other Interesting Thoughts on the North American Crow /Hawks Aloft Inc.
Last week during a school program at La Mesa Elementary School, we presented our Avian Ambassador, Indigo, a North American Crow. After discussing her history and talking about raptor adaptations and how a bird like Indigo differs from hawks, falcons, owls, and eagles, I asked the students if they had any questions. A third-grader in the back of the room hoisted his hand up immediately and asked pointedly, “Why are crows black?” It is such a straightforward question, but one with a complex answer. 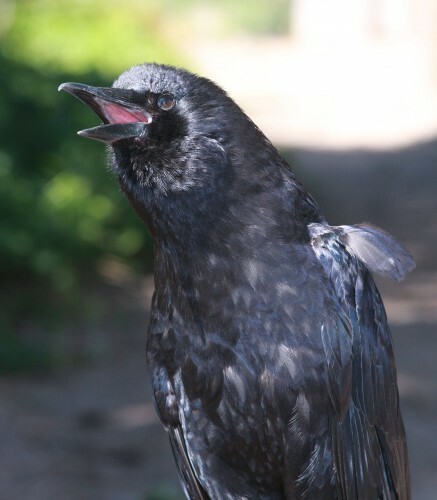 The answer is: no one really knows why species of corvid like the North American Crow or the Common Raven are black in coloration. The best guess that evolutionary biologists can give us is that flocking birds like crows use coloration as a quick way to identify other members of the same species. In one story from the Sioux Nation, the crow was once white as snow. After continually thwarting the hunting efforts of the tribe’s cleverest hunters, they caught the biggest, most important of the crows and, as a punishment, intended to burn him. The crow was very sly, however, and got away, but his feathers were charred, and ever since, all crows have been black. In Lenape legend, the crow was once rainbow colored—the earth’s most beautifully feathered bird. During a long, very cold winter, the Rainbow Crow flew to the heavens to ask the Great Sky Spirit for help. He gave the crow fire to take back to the animals of the land. When Rainbow Crow returned to earth, however, he was a different bird; on the return journey the flame had scorched his feathers black and made his beautiful voice a harsh croak. 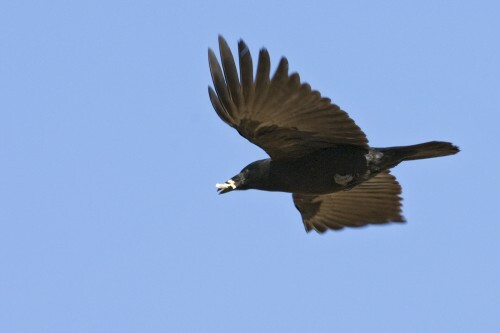 Regardless of why or how, crows and ravens are black from their bills to their legs. As extremely social birds, crows sometimes form flocks up to one million in number. Just imagine what that might look like overhead! Besides being one of the few completely black North American birds, crows are also exceptional due to their advanced cognitive abilities. Scientists working throughout the world have proven the crow’s ability to recognize human faces—which is, incidentally, an extension of their keen ability to recognize one another. 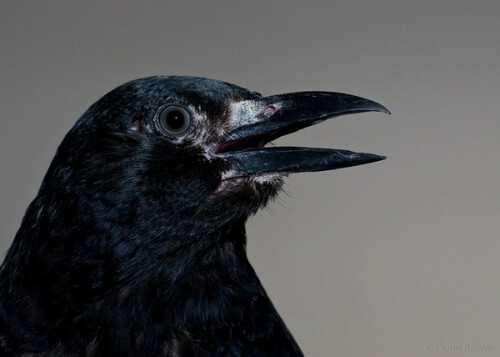 Crows are also known to have complex communication systems that include regional “dialects” and a long-reaching memory—for example, crows have been known to change their entire migration routes to avoid farms where a single crow has been killed in the past. Since crows are well adapted to living among human beings, you’re likely to encounter them nearly anywhere—Downtown, Uptown, the foothills, near the Bosque, and beyond. Next time you observe one of these dark birds flying overhead, take a moment to appreciate their unique characteristics and intelligence. Thank you my husband and I have this ongoing laugh cause I watch them in hundreds fly in morning towards North then before dusk they come back each day. Cloudy days they congregate on a neighbors tree and hundreds go crazy diving at each other or fly in circles. I laugh when they get walnuts and land on my roof to break open or drop in street to break open.always wondered if they were studied. Most when I hear them going crazy loud I know it’s my chance to photograph a hawk and crows diving at it.